SIX Sets of our cozy 100% cotton flannel sheets. 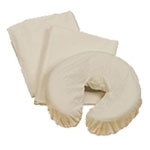 Made in USA these three-piece massage table sheet sets are made of 4.5oz double brushed, low pill, soft 100% cotton flannel material. Available in White, Natural, Blue, Lavender, and Sage. Made in the USA these three-piece massage table linen sheet sets are made from our most popular 50/50 poly-cotton interlock jersey material. Designed for no-pill, no run, and no shrinkage this superior fabric is perfect for massage and spa therapy. Available in White and Natural.